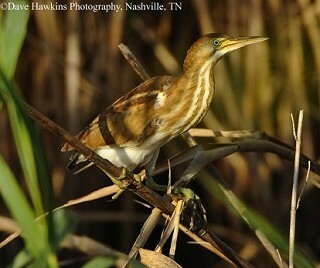 The Least Bittern is the smallest of the herons and one of the most difficult species to see in Tennessee. It is not only secretive in its behavior but inhabits dense marsh vegetation. It breeds in scattered locations across the state and is present in Tennessee from late April to September. The Least Bittern breeds in wetland areas throughout the eastern U.S. and along the Pacific coast, and in scattered localities in the western states, Mexico, the Caribbean, and Central and South America. They spend the winter from the mid-Atlantic seaboard to south Florida and southward through South America. Their low coo-coo-coo song is reminiscent of a Black-billed Cuckoo song. Description: This tiny, secretive heron has a long neck and bill, and a dark crown and back. The neck and sides are a buffy-yellow, and the front of the neck and chest are striped orange and white. The wings have conspicuous pale brown patches visible in flight. Males and females are similar, but females have more muted colors. Green Herons are much larger and darker, with completely dark wings and a dark bill. American Bitterns are huge in comparison, and are overall warm brown in color. Rails have shorter necks and lack pale wing patches in flight. Habitat: Marshes with tall, emergent vegetation, such as cattails, giant cutgrass, and rushes with areas of open water. Nesting and reproduction: Least Bittern pairs may nest singly or in loose colonies. They will nest in large and small marshes. In Tennessee, a pair of Least Bitterns was found nesting in a marsh of only 1 acre in size. Clutch Size: Usually 4 to 5 eggs, with a range of 2 to 7. Incubation: Both adults incubate the eggs for 17 to 18 days. Fledging: Both adults feed the young, which leave the nest in 6 to 9 days. Nest: The nest is an elevated platform of marsh vegetation with a canopy made by pulling tall marsh plants over and crimping them in place. It is placed in dense, tall stands of vegetation, usually close to open water. The male does most of the nest building. In Tennessee, nest heights range from 4 inches to 4.5 feet above the water. Status in Tennessee: The Least Bittern is an uncommon migrant and summer resident in Tennessee arriving in late April and departing by late September. It breeds in scattered locations across the state. Listed as In Need of Management by the State of Tennessee. When alarmed, the Least Bittern will often freeze with its bill pointed straight up, and sometimes sway from side to side as if imitating waving reeds. The Least Bittern can feed in water too deep for it to walk in by gripping onto reeds with its feet. They will also build small foraging platforms at rich feeding sites, catching fast-moving prey that swim by. John James Audubon observed a captive bird walk easily between two books that were 1.5 inches apart, though the bird measured 2.25 inches across. This would indicate that the bird is capable of compressing its body to an amazing degree. Best places to see in Tennessee: Reelfoot Lake, Standifer Gap Marsh, Chattanooga, Hamilton Co.
Gibbs, J. P., F. A. Reid, and S. M. Melvin. Least Bittern (Ixobrychus exilis). The Birds of North America, No. 17 (A. Poole, P. Stettenheim, and F. Gill, eds.). Philadelphia: The Academy of Natural Sciences; Washington, DC: The American Ornithologists' Union.